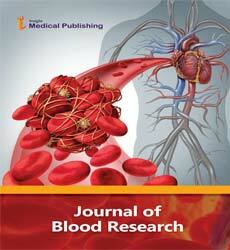 The Journal of Blood Research is a peer-reviewed, open access Journal dedicated to publish the latest advancements in all aspects of Hematologic disorders such as anemia, thalassemia, sickle cell disease, thrombocytopenia, leukopenia, thrombosis, hematological neoplasias, bleeding/clotting disorders such as hemophilia, and blood related infections such as malaria, typhoid and dengue. The Journal solicits studies that offer strategies for treating and managing the disorders related to bone-marrow, the hematopoietic stem-cells, granulopoiesis, megakaryocytopoiesis, and various hematopoietic like the erythroid lineage, the myeloid lineage, and the lymphoid lineage. Apart from paying special attention on studies pertaining to various components of blood such as hemoglobin, hematological markers, immunohematology, and hemagglutination studies, the journal discusses s therapeutic techniques like bone-marrow transplant, stem-cell transplant, and blood transfusion, with special emphasis on clinical research. Haemostasis or hemostasis is a process which stops the bleeding process, meaning to keep blood within a damaged blood vessel. It is the process of arresting the blood flow from an injured blood vessel or organ of the body which requires the combined activity of vascular, platelet, and plasma factors. It is the first stage of wound healing. This involves coagulation, blood changing from a liquid to a gel. It is the process of formation of blood cellular components. Haematopoietic stem cells from the bone marrow are required for the formation of blood cellular components. It includes erythropoiesis, lymphopoiesis, myelopoiesis, granulopoiesis, and megakaryocytopoiesis. Anemia is a condition in which there is a deficiency of haemoglobin or red cells in the blood. It is caused by blood loss, decreased red blood cells or by the destruction of red blood cells. The body does not produce enough healthy red blood cells to carry adequate oxygen to tissues in case of anemia. It is the branch of medicine concerned with the study of the cause, diagnosis, treatment, and prevention of diseases related to blood in children. It is a branch of haematology which studies antigen-antibody reactions and analogous phenomena as they relate to the pathogenesis and clinical manifestations of blood disorders. Immunohematology deals with preparing blood and blood components for transfusion as well as selection of appropriate, compatible components for transfusion. It is also called as "blood banking". Stem cells are undifferentiated cells of a multicellular organism which are capable of giving rise to indefinitely more cells of the same type, and from which certain other kinds of cells arise by differentiation. These are found in bone marrow. Stem cells can be used in the therapy of variety of diseases including Parkinson’s disease, Alzheimer’s disease, Lou Gehrig’s disease, and strokes. It is the branch of medicine that is concerned with transfusion of blood and blood components. Transfusion medicine includes understanding of federal regulations related to blood products and laboratory management. Neoplasia is new, uncontrolled growth of cells that is not under physiologic control. A "tumor" or "mass lesion" is simply a "growth" or "enlargement" which may not be neoplastic. The term "cancer" implies malignancy, but neoplasms can be sub-classified as either benign or malignant.